Back in March, after hearing Frances Scott speak, I became a 50:50 ambassador and since then I have been selected as Dartford’s Women’s delegate for the 2018 Labour Party Conference. I travelled to Liverpool on Saturday 22 September for the Labour Women’s Conference – a meeting of 1,000 women – which commenced the 5 day event. At the Women’s Conference there was recognition that The Labour Party now has more female members than the Conservative and Liberal Democrats have female members combined. But there is more to do. As Labour General Secretary Jennie Formby says we need women in every level of the party – all the way to the top. In true ‘ask her to stand’ style Jennie urged the women in the room to encourage all those they knew with talent to get involved. Debbie Wilcox, of the Welsh Local Government Association followed this speech by acknowledging that activism may be exhausting but we must not give up. The women who went before us were imprisoned and tortured for us to get to this point. Politics needs more women, and we must ensure we get them. I feel strongly that the structures and protocols of British politics make them inaccessible to many women. Meetings are often set at times and places difficult for those with caring responsibilities. And when women do get to meetings they are shouted down by men. Women are subject to harassment, not just online, simply incomparable to that experienced by male colleagues. But I passionately believe politics needs a variety of voices if we are to create a better world for all. I wrote about this here. 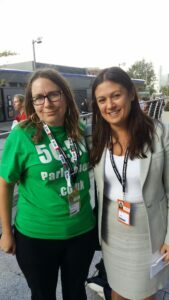 Wearing my 50:50 t-shirt I felt able to approach many MPs and other significant figures in the Labour Party and talk about our campaign with them. It was heartening that most of them were already very aware of 50:50 and keen to continue to offer support. I spoke with delegates ranging from Lord Prescott, Baroness Chakrabarti and Lord Baker, Cabinet Ministers Dawn Butler, Angela Rayner, Emily Thornberry and MPs Danielle Rowley, Rosie Duffield, Tracey Bradbin, Nas Shah, Lisa Nandy, Welsh Deputy Carolyn Harris and Shadow Chancellor John McDonnell. None of them disputed the view we need more women in politics and there seemed a consensus that the next leader of the Labour Party would be a woman. 2018 is the first year the Women’s conference had policy making powers, so it was especially exciting to attend. One reason 50:50 want to increase female representation is that men and women have different experiences and that this, in turn, brings different priorities. I was delighted to be in the room when Shadow Minister for Equalities, Dawn Butler made two announcements. First, she committed Labour to ensuring survivors of domestic abuse can take up to 10 days paid leave – giving them crucial time to leave their abusive partners safely and get the help, protection and support they need knowing their livelihood is secure. Second, she announced that the next Labour government will create a standalone department, headed by a secretary of state to reduce discrimination and inequality. This was further good news for women. The women’s conference had four motions, concerning women and the economy, childcare, abortion, women’s health and safety. It is vital that we have women’s voices drawing attention to issues that rarely form part of the political narrative or debate. For example childcare is a structural issue which impacts on the ability of parents (usually women) to participate in the economy. Women ask why childcare does not receive the attention that, say, issues about the railway do. Many delegates spoke about their experiences. One woman spoke movingly about her experience as a teenage mum in a violent relationship whose life was changed by her local Sure Start Centre. Discussing abortion another delegate spoke about her experience of having a termination of a wanted pregnancy because she was having cancer treatment. This, was for me, testimony as to why we need more women in parliament, because without them experiences like this do not form part of the narrative. Given the events of the last year it was no surprise that sexual harassment arose in many discussions. Women MPs spoke movingly about the harassment they had endured. 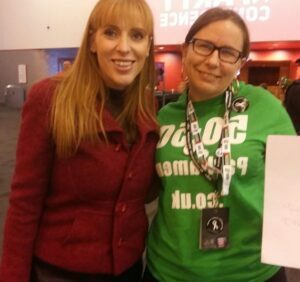 Bex Bailey was roundly praised at a rally organised by the Labour Women’s Network for her work leading to a rule change being voted in, at the main conference, which would make the complaints procedure independent of the Party. What become obvious to me, as I spoke with women who had been involved in politics at every level, is that women can only ever really progress in politics with the support of other women. 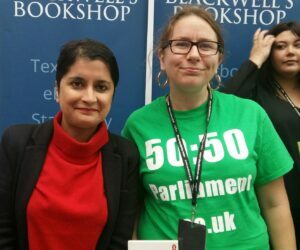 I was the only delegate from my Constituency Labour Party at the Women’s Conference, and at times I found this quite lonely – though after I met up with some other 50:50 activists I immediately felt I had found friends. As important as political activism is, women need to work hard to support each other, to build a real sisterhood of support. With this in mind I have joined the Labour Women’s Network and am going to apply for their training programmes. We are stronger when we support each other.